This Butler Creek Loader manufactured by the famed Israeli Maglula will be sure to help you load your magazines quickly and efficiently so that you can spend more time at the range shooting. This is designed for AK-47 (7.62x39mm) rifle magazines or Galil (5.56x45mm) rifle magazines allowing you to rapidly load and unload magazines. Please note that this will not work on AR-15 styled magazines chambered in 5.56x45mm..
For a demonstration of this product, click play on the below video. Easiest magazine loader I've ever had. Very pleased. Beats the heck out of destroying your thumbs! LG's service and price were great. The loader itself is high quality and well made. I can only give it 3 stars for performance. It works a lot better than manual loading and it will completely load a 30rd mag but it is a little tricky. 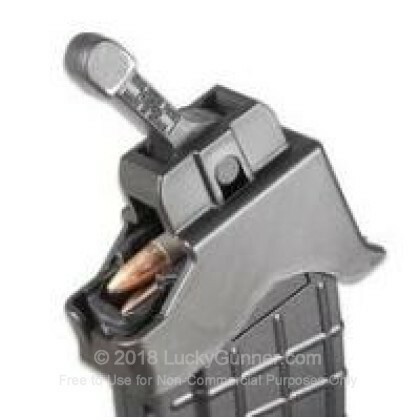 You have to snap in on the back tab of the mag just right and hold it just right as you load it. Even then it will slip off the back tab or unseat in the front so you have to exercise some patience. Additionally, it is a struggle to get the last few round loaded in some mags. Not as easy to use as my ProMag (plunger style) loader for my AR-15. Q: Will the Butler Creek AK47/ 7.62X39 Galil magazine loader work with my Sagia 7.62X39 SCM tactical magazines (made in the USA) ? 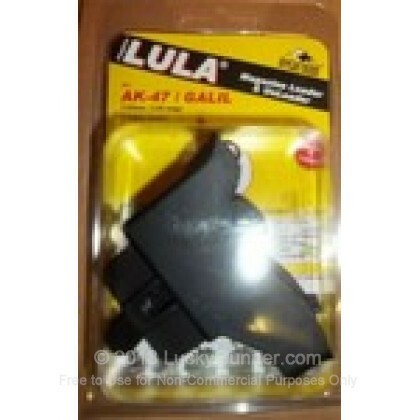 A: Hello Robert, The Butler Creek AK47 magazine loaders should work great for your Saiga magazines. You shouldn't have any problems with them.